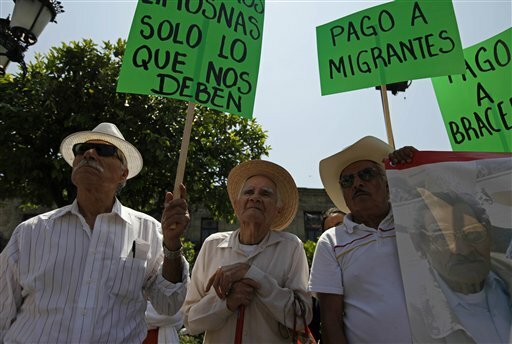 About 400 people marched outside the North American Leaders Summit in Guadalajara, Mexico on Sunday to protest the negative affects of free trade and to demand benefits for retired Mexican laborers who worked in the US. The sit-in at the Vestas wind-turbine plant on the Isle of Wight came to an end on the 19th day when bailiffs arrived to evict the six remaining workers on Friday. A day later, workers took part in a rally outside the factory gates as part of their pledge to continue fighting for their jobs. Another Vestas factory on the Isle of Wight has been hit with a sit-in. Late last week three activists appeared on the roof and unfurled a banner that read: “Vestas Workers – Solidarity in Occupation. Save Green Jobs.” Since then three more have joined the protest. A dozen state workers in Oakland, California marched in front of the state house to protest a budget cut known as “Furlough Fridays,” which is forcing them to take off three Fridays a month without pay for the rest of the fiscal year. Scotland’s first Climate Camp comes to an end today amid reports of anonymous activists sabotaging a coal conveyor belt that leads to the largest power station in Britain. Fifteen Greenpeace activists, including a ship captain, were rung up on charges in relation to two protests of the Queensland coal terminal last week.